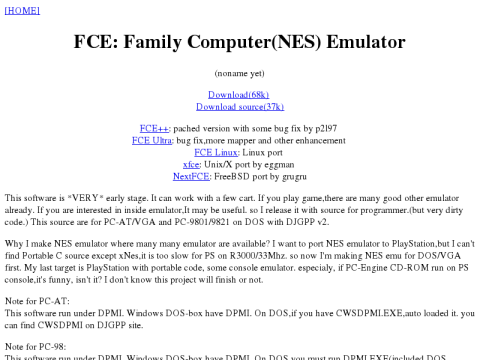 Why I make NES emulator where many many emulator are available? I want to port NES emulator to PlayStation,but I can't find Portable C source except xNes,it is too slow for PS on R3000/33Mhz. so now I'm making NES emu for DOS/VGA first. My last target is PlayStation with portable code, some console emulator. especialy, if PC-Engine CD-ROM run on PS console,it's funny, isn't it? I don't know this project will finish or not.